Welcome Vendor! Ready for MWGB?! 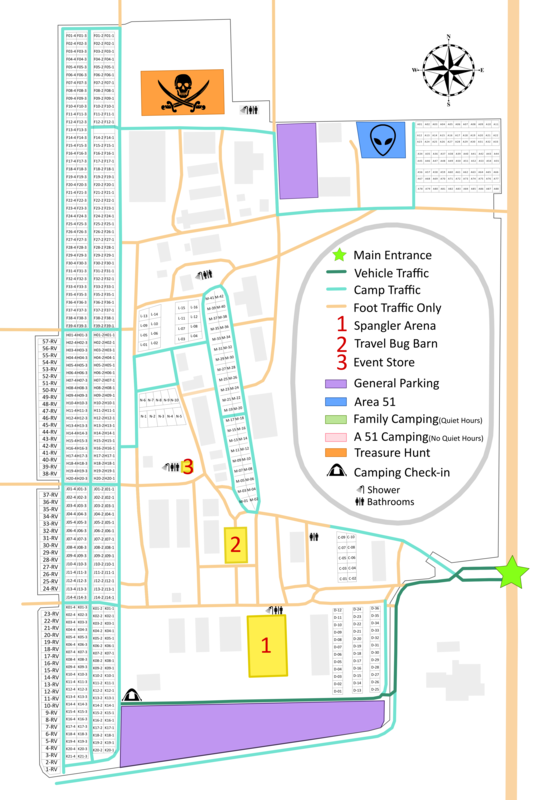 :) When arriving, enter the grounds through the Main Gate marked with a blue triangle in a circle. Follow the road (also in bold blue) and you will see Spangler Arena ("1" on this map). This is the center of the event and where vendors set up. On the west side of Spangler Arena is a grass strip and doors. You can use this area to load your setup into Spangler. Please do not drive into Spangler! Space permitting, you can leave your trailer / vehicle parked here. The area to the north is more narrow and your trailer / vehicle should not block access by other vendors to that area. Please park 6 feet from any doors so we can ensure use of the door in case of emergency. We are inspected by the fire department and health department. We will ask you to move your car or tow your vehicle if it is blocking an exit. Ensure you keep these paths open and if in doubt - consult an event staff member. You may only occupy your space during "flea market" hours listed on the event schedule. One hour before and one hour after posted flea market hours are permitted for the purposes of setup and tear down only. Anyone who conducts sales outside of the vending area and/or outside of these hours will be asked to vacate the grounds and will not be invited to future events. Your space will be labeled with a paper sign and your name, you will be responsible for finding it and setting up your area. You must tear down and vacate Spangler Arena by 9pm on Saturday evening. Items vended should be appropriate for the event atmosphere. This is at the sole discretion of the organizers. If you feel your product may not be considered appropriate, we encourage you to discuss with the organizers before arrival. Looking forward to seeing you! If you have any issues when you arrive, please ask for Ian.